We are delighted to be returning to both St Stephen’s Church, Norwich (which seems to be becoming our new home-venue) and to the wonderfully atmospheric Binham Priory, for our next two concerts. The programme will be the same at each so only the most devoted fan needs to contemplate coming to both! Our soloist is Catherine Martin, principal of the Gabrieli Consort and Players and a sought-after violin soloist and guest director around the UK and abroad. 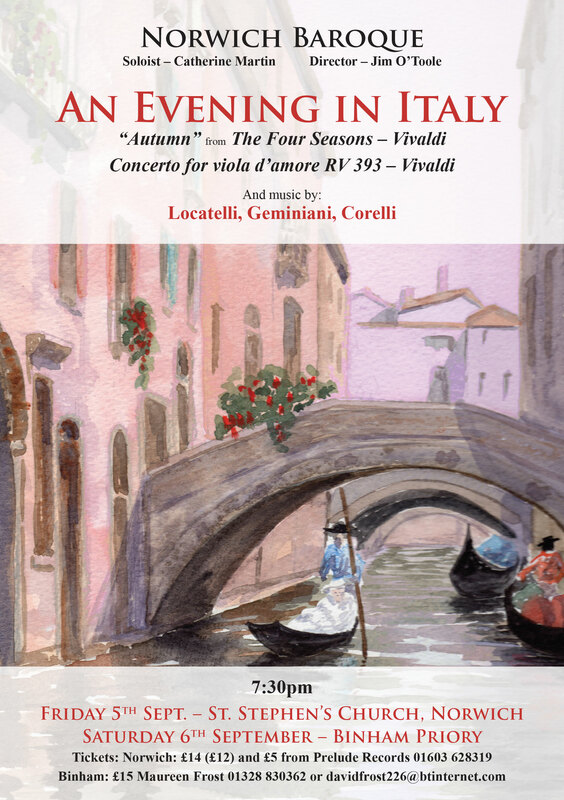 She will feature in two concertos, both by Vivaldi: a concerto for viola d`amore, an instrument rarely heard taking the limelight, and then, swapping back to violin, the 3rd concerto of the much loved Four Seasons, “Autumn”. Additionally you will be treated to music by four more of the greatest Italian Baroque composers: Locatelli, Scarlatti, Geminiani and Corelli, masters of composition for string ensemble. So, do consider joining us for our trip to 18th Century Italy.